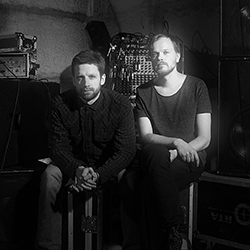 Black Water (aka Ele 7) are electronic music artists from Vilnius. Initially having started out as a band of seven members, spicing their electronic sound with live vocals and musical instruments (guitars, drums), today they are a duo – Mantas Ažondenis and Vaidotas Mikulka. After their debut performance at the electronic music festival “Supynes” in 2007, Ele 7 managed to raise the roofs of all the biggest clubs in Lithuania, and in 2011 the electronic act released their debut album, “Open Air”, which neatly comprised the early tracks of the band – 15 untitled songs – sonically ranging from dance-floor oriented electronica to alluringly unfamiliar ambient. Fully ripe and mature, today Ele7 are decisively shedding their well-known skin and presenting their new alter ego – Black Water, followed by a new EP, “Let’s Pretend”. The duo’s intense, imaginative and exciting tracks, which are influenced by the Cologne electronic sound smithy (Kompakt Records), immediately transport you to a thrilling dance floor that echoes with the sounds of romantic electronica, minimal, techno and house in a way that can only be conceived in the shadow dripping heads of Black Water.